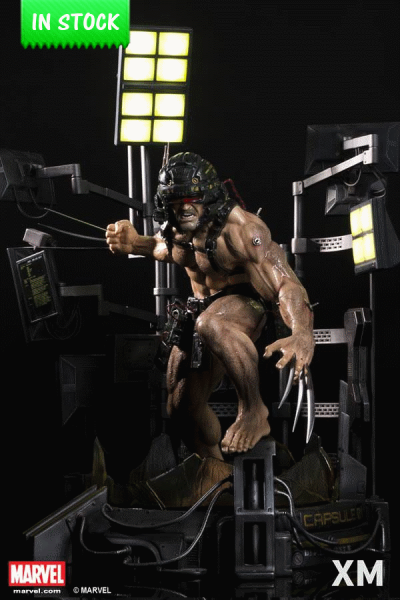 Zitat: XM Studios is excited to present our next Marvel Premium Collectibles series statue, Wolverine - Weapon X Project! The tortured and deranged Logan James Howlett from the cruel Weapon X Project also known as the beginning story arc of Wolverine with Adamantium claws and skeleton, is immortalized in amazingly detailed 1:4 scale cold-cast porcelain. Each painstakingly handcrafted statue is individually hand-painted with the highest possible quality finish. 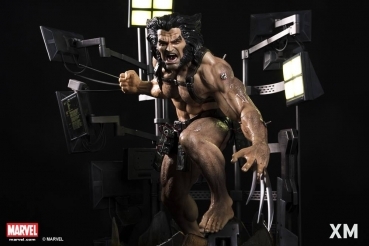 The statue depicts Wolverine's escape from the Weapon X Project Labs, filled with feral rage in his pained and unstable mental state. The origins of the clandestine Weapon X Program date back to 1945 when a civilian advisor to the American military named Thorton investigated a liberated concentration camp and discovered the hidden laboratory of the enigmatic geneticist Mister Sinister. Using Sinister’s research as the basis for his own work, Thorton, also known simply as the Professor, chose Wolverine as his first test subject. Wolverine was kidnapped and taken to a Canadian facility where he was subjected to a brutal process in which the near-indestructible metal Adamantium was bonded to his skeleton, including his mutant claws. The Professor was surprised at the full extent of Logan’s mutant nature, which enabled him to recover from the process far more rapidly than anticipated. Reduced to a quasi-mindless state, Wolverine was sent to slaughter the inhabitants of the small town of Roanoke as a test of his abilities. Wolverine ultimately broke free of the Professor’s conditioning and ran amok in the Weapon X facility. In the course of his escape, he slew most of the facility’s personnel.